From version 5.15, it is very easy to switch from the normal user mode to the administrative mode! Many users who also use other desktop tools require the full administrative mode under Windows, so that they can use it completely and without restrictions, such as the screenshot function, always-mouse-wheel, etc. See ► . .. DesktopOK Tools + functions ! For this reason, a quick switch in DesktopOK from Ver 5.15 directly from the main menu is possible to save yourself several clicks and steps. (Image-1) Switch from the user to the administrative mode! 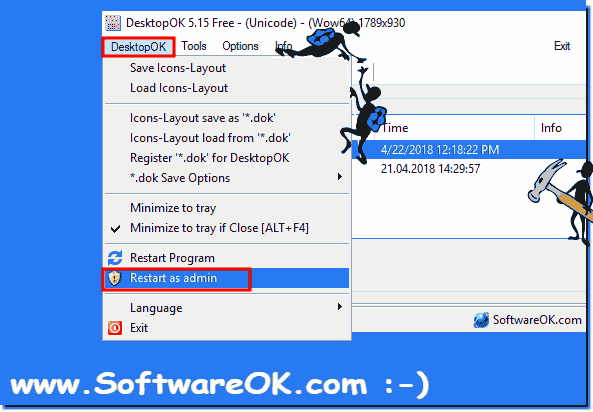 DesktopOK - FAQ-30: How to switch to the administrative mode?